The BlackLine Transaction Matching solution streamlines and automates detail-heavy reconciliations, such as bank reconciliations, credit card matching, intercompany reconciliations, and invoice-to-PO matching—all in one centralised workspace. The solution handles highly complex matching scenarios and highlights incomplete or missing data to ensure time sensitive exceptions are routed to the correct staff. Millions of transactions can be reconciled automatically each minute. Automating the transaction matching process is a quick win for organisations as the benefits can be realised quickly. It shortens the financial close, eliminates tedious manual labour and frees up finance and accounting staff to focus on more value-add activities. Upload transactions from different data sources into BlackLine for use in the matching process. Configure rules driven matching process to automate the matching process and 'suggest' matches based on user defined criteria. 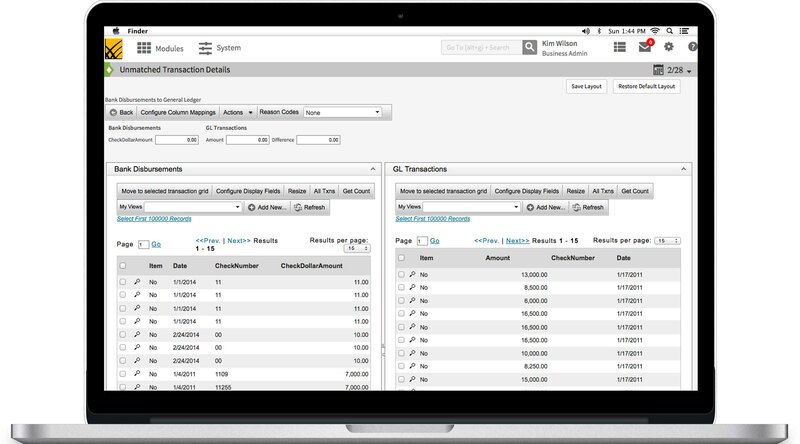 Quickly identify unmatched transactions, significantly reducing the time spent locating discrepancies. Deal with unmatched transactions by quickly and easily creating reconciling items as part of a reconciliation and including a direct link to incorrect transactions within a correcting journal entry.